also the lives of learners therein. Scholarships enabled over 60 bright but financially disadvantaged children to attain education that would have been beyond their reach. In the 2017 UCE “O-level” UNEB results, we gained 12 first grades, 6 of whom were on UHST scholarships. In A-level, our best student scored 14 points and had been on a UHST scholarship through out her secondary schooling. Joan is now pursuing a B.A. degree course at university. academic improvements at our school. Solar systems donated by UHST enable students in the boarding section to study even when mains power goes off, as it often does. Our children are happy at this development. computer literacy, general education and as a leisure activity for the whole school. 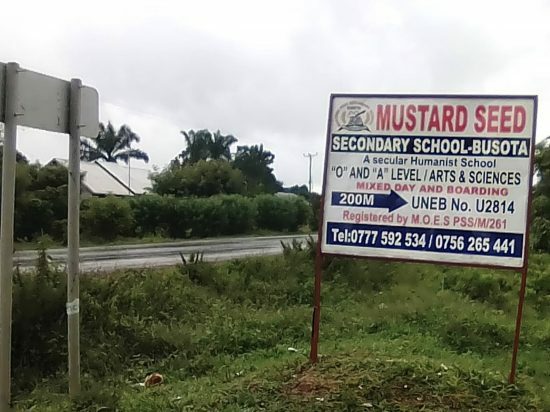 Most importantly, we have been able to take out long-term leases on all school land, except for one plot remaining, with legal fees met by UHST. The school now has safe piped water supplied by national water which has greatly improved on hygiene and sanitation. The Four class room block at the lower campus(football field) funded by UHST has allowed us to reduce class sizes. Furthermore, the entire campus is fenced with chain link for children’s security. The computer room is still small and needs a bigger space to allow it serve its intended purpose. The same applies to the existing library. Dormitories are no longer enough for the children. A multi purpose hall is needed to have children served meals from one place as opposed to eating from dormitories, and to use for school meetings, concerts and examinations. Nonetheless, we shall reach there.